You can probably tell that much of the food I’m cooking these days is inspired by dishes from all over the world. I love making and eating French classics, Mediterranean and Middle Eastern inspired recipes and am equally happy making simple dishes from anywhere in Asia. My pantry has an ever expanding collection of ingredients. A few weeks ago Lou asked me to go round to Tai Ping Trading on Beach Rd to buy some kimchi for the Mexican/Korean tacos that chefs were creating. Walking in past the cooked ducks hanging in the window made me start obsessing about having a meal of Peking duck. 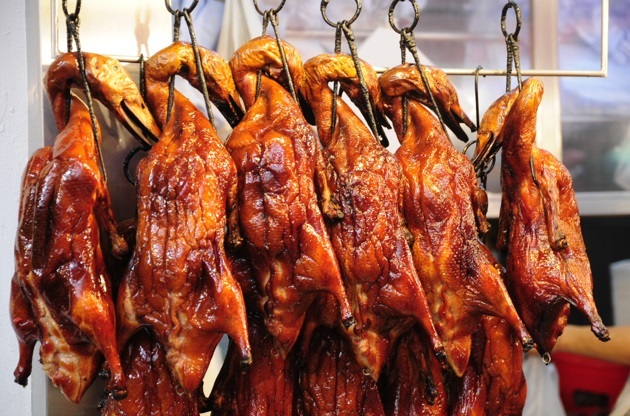 In our rag trade days we spent a lot of time in Hong Kong and Taiwan and always had one or two meals that included Peking duck and I can still vividly recall the taste. 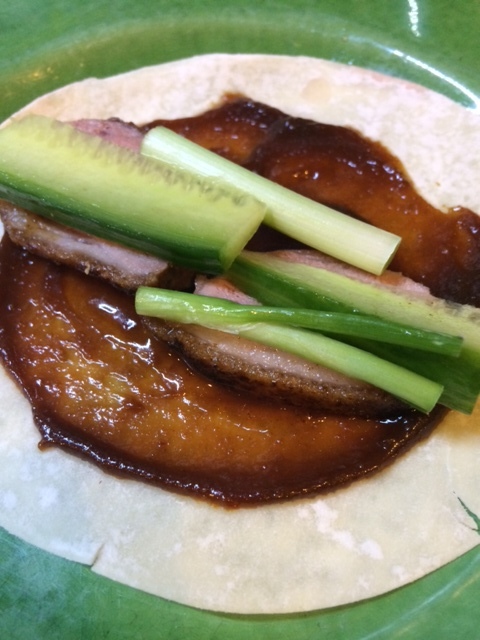 So, on the way home from work one day I made Mike detour to Tai Ping and we bought a duck, the appropriate pancakes, spring onions, cucumber and a jar of sauce labelled ‘Secret Recipe Peking Duck Sauce’ (hoisin sauce or plum sauce are also fine). I couldn’t cope with the thought of the duck’s head so asked them to cut it off for me. Once home I put the duck in a hot oven for a few minutes to crisp the skin back up. It was absolutely delicious. Then a couple of days, knowing that I couldn’t hope to cook a whole duck with perfect crispy skin I decided to make a version of Peking Duck using duck breasts making the emphasis on perfectly cooked juicy breast rather than all crispy skin. It’s so easy and quick. Simply heat a heavy cast iron frying pan till medium hot. Place the duck breasts (1 per person) in the pan skin side down. The fat will start to run and the skin brown. Cook for about 8 minutes. During this time you’ll need to pour off the fat once or twice. When the skin is golden and crisp, remove the breasts and sprinkle them all over with a mix of Chinese five spice powder (½ tsp) and fine sea salt (1 tsp). Put the breasts back into the pan flesh side down and cook for another 3-4 minutes. Remove from the pan and let them rest for 3-4 minutes. Don’t cover them as the skin won’t stay as crisp. Then slice. Assemble your own pancakes spreading each with sauce, then slices of duck breast, spring onions and cucumber batons.